The Voorstraat (Front Street) faces south onto the ocean, running about half a mile (1km) east to west, and is the main drawcard in Philipsburg for tourists. At its eastern end is Wathey Square, housing the tourist information kiosk, just a minute's walk from the semi-circular Great Bay Beach, and two casinos, the Rouge et Noir and the Coliseum Casino. 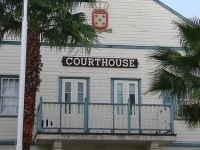 On the north side of the square is one of the town's most impressive buildings, the white wooden courthouse topped with a cupola, built in 1793 and now serving as a post office. Just off the west of the square is the quaint Methodist church built in 1851. Farther along Voorstraat is a group of elegant colonial houses, and at the far end is a small museum and two large marinas. Voorstraat is also known as the best shopping area in Philipsburg. A number of jewellery stores, perfume boutiques and electronics shops take advantage of the island's duty-free status to draw tourists in their droves.